Emory University has seen a record number of applications for the first round of Early Decision admissions to Emory College of Arts and Sciences and Oxford College — and accepted a record 30 stellar students from the QuestBridge National College Match program to its Class of 2022. 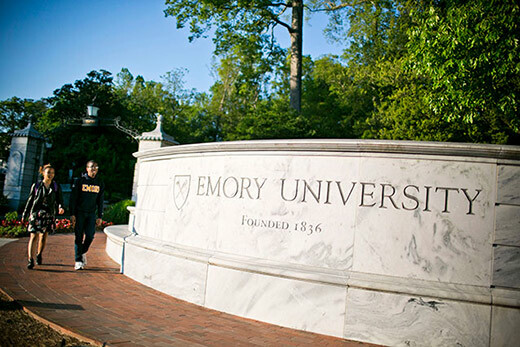 More than 1,700 students applied to Emory in the first round of Early Decision. The admitted QuestBridge Scholars cohort is three times the typical yearly match with the national non-profit that links highly qualified, low-income students with a four-year financial aid award that covers full tuition and fees to some of the nation's best colleges. At the same time, admission rates for the first round of Early Decision to Emory University’s undergraduate colleges fell to 31 percent for Emory College and 25 percent for Oxford College. In December, 503 students were offered admission to Emory College and 223 to Oxford. “Combined with our QuestBridge effort, the Early Decision I students are an outstanding start to the building of the Class of 2022,” says John Latting, dean of admission. The deadline for Early Decision II and Regular Decision applications is Jan. 1, to round out classes of 1,350 students in Emory College and 485 in Oxford College. Based on the first round of admitted students, admission officials say applicants continue to remain highly competitive in scores, achievement, diversity and engagement. The 30 QuestBridge Scholars admitted to Emory College are among just 916 QuestBridge students nationwide who earned full-ride financial aid awards covering full tuition and fees to one of 39 universities they matched for study. The increase in QuestBridge Scholars is a response to Emory’s commitment to diversity, including socio-economic diversity among students, and the effort to ensure an excellent liberal arts education is accessible for qualified students. “We are committed to creating an environment at Emory that promotes full participation and inclusive excellence at all levels of the academy, and our work with Questbridge is an important mechanism for advancing that objective,” says Dwight A. McBride, provost and executive vice president for academic affairs. The incoming QuestBridge Scholars come from 15 states, including rural areas where Emory is less well-known, and almost all are among the first in their families to attend college. In addition to being involved in school and community activities including debate, orchestra, varsity sports and math team, more than half of the students work at least 15 hours a week during the school year and full time in the summer. Planned majors for the cohort include biology, business, computer science, film, history, international relations, languages, political science and psychology, in addition to pre-professional programs in medicine, law and nursing. The students must be academically qualified to attend Emory and other partner schools, with strong performance in rigorous AP/IB classes as well as high standardized test scores. The 30 who matched with Emory could have selected a number of elite institutions to attend but specifically ranked Emory as a top choice. “QuestBridge provides access to a lot of students who would not otherwise apply or think about these great institutions,” says Timothy Fields, associate dean of admission. “And these institutions benefit greatly from having these students on campus and in the classroom." Here, the scholars will join the largest on-campus Quest Scholars Network in the country, with about 320 students at both the Atlanta campus and Oxford College. Members include previous years’ matched scholars as well as other QuestBridge students who choose to enroll at Emory. In its decade as a QuestBridge partner, Emory has twice hosted QuestBridge summer conferences for rising seniors to connect with all partner institutions and receive resources and support on the application process. With that history, Emory expects to see additional QuestBridge Scholars apply and enroll in the Class of 2022, both at Emory College and Oxford College, as the application process continues. There has also been a significant increase in interest in Oxford College, home of Emory's original 1836 campus in Oxford, Ga. While Early Decision I applications to Emory College increased by 7 percent, they jumped 47 percent for Oxford. Kelley Lips, Oxford’s dean of enrollment services, says the college often hears from students interested in the distinctive, small, liberal-arts environment, where faculty are dedicated to teaching and there are significant opportunities for leadership during the first two years of their undergraduate studies. Students who enroll at Oxford continue their studies on Emory’s Atlanta campus as juniors.